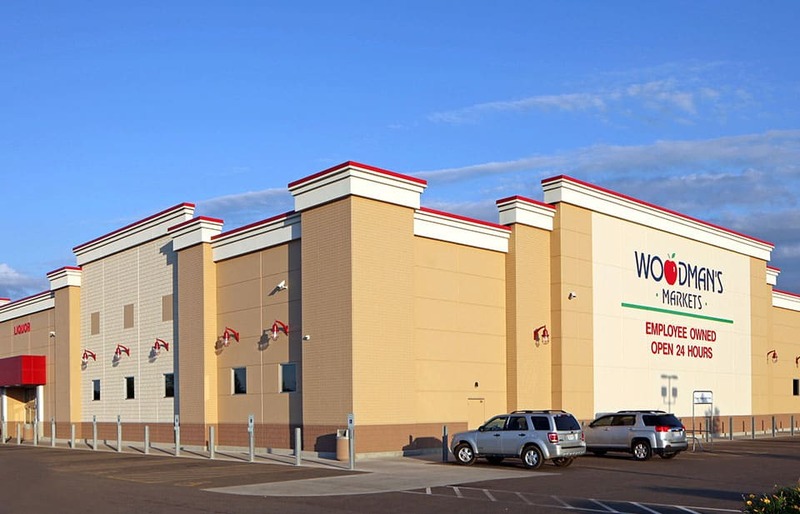 As the exclusive design+build firm for Woodman’s Food Markets, Inc., FoxArneson was contracted to design and build a new store presence in the Eau Claire, WI market. Woodman’s had identified a 35-acre project site at a busy intersection to become the future home of a 226,000 square foot grocery store and 12,000 square foot liquor store. The site also would have a 5-dispenser gas station, a 3-bay lube center and a 2-bay car wash.
FoxArneson began with site planning which involved a rigorous requirement gathering and evaluation process that is typical for large-format retail projects. During this process, FoxArneson needed to seek variances to the local zoning building codes and accomplish the local municipalities requirements for architectural aesthetics, landscaping, parking lot densities, light pollution and a variety of other technical building requirements. Additionally, the property presented some unique challenges and site constraints which required FoxArneson to remove and excavate a large hill into a flat construction site. The team also encountered an active rail line behind the property, high voltage transmission lines and buried gas lines all of which could not be relocated. FoxArneson’ solution was to dig into the hillside and build significant retaining walls to hold the earth back and make modifications to the existing Woodman’s building design prototype to accommodate the building site’s unique landscape. Upon receiving approval on the design solution, FoxArneson was able to begin the construction phase for new Woodman’s store, gas station, lube center and car wash which included roadways as well as the necessary infrastructure around the facility that included several outlots that would be allocated and sold to other business entities. Due to the careful planning and site evaluation that occurred up front, the overall construction process was able to move forward smoothly and efficiently for an on time and on budget project completion.